With panoramic sea views and an acre of tropical land to enjoy, beachfront Freyers Well Bay House is a stylish holiday home that's perfect for idyllic retreats. The views over the cliffs and out to the sea are simply breathtaking. 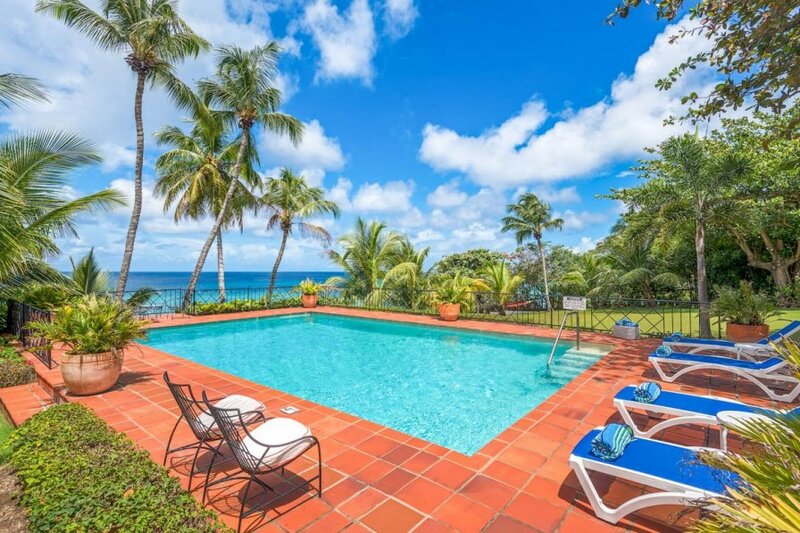 This Barbadian-style villa is located just outside of Speightstown, with a secluded beach just a short walk away. The interior is just as impressive as the outside space, with spacious and airy rooms throughout. The open plan living/dining room is a glorious place to enjoy getting together with loved ones and feel the Caribbean breeze flowing all around. There's enough comfortable seating for everyone to enjoy watching films on the flat screen television as evening falls and patio doors open onto the outside space. The dining area features a table that seats up to eight people and offers access to a covered area with even more dining and seating options. The fully equipped kitchen has all the modern facilities either you or your cook will need to prepare and cook meals. There are three bedrooms in total and all have ceiling fans, air conditioning and a television each. The master bedroom and one other have a king size bed each, with the third bedroom featuring two twin beds that can be made into a king size bed. The master bedroom enjoys its own ensuite bathroom, with a lovely family bathroom for use by all guests. Step in the beautifully-maintained lawned gardens with exotic plants and trees creating a totally tropical feel. There are hammocks and shaded areas to enjoy throughout the garden, giving you utter peace and quiet. The pool terrace is particularly impressive, with a huge, private swimming pool that's surrounded by loungers and offering unspoilt sea views. Right down by the edge of the garden overlooking the cliffs is a charming, dining gazebo for al fresco meals with unbeatable views. Freyers Well Bay House can be found dotted along the Barbados coastline, overlooking the Caribbean Sea. This villa has exceptional outside areas that will leave guests constantly reapplying sun lotion, in efforts to make the most of the garden. There are many convenient amenities and interesting attractions within a short distance of Freyers Well Bay House. It's easy to head out for an evening meal to sample some delicious local Bajan food or to stock up on holiday essentials. Walk to a secluded beach within a matter of minutes. Here you'll find soft, white sand that's shaded by nodding palm trees and lapped by impossibly clear waters. Lie back on the beach and relax as you listen to the waves or dive into the calm sea for a swim with the family. As the water is so clear you can also have a go at snorkelling and enjoy spotting all sorts of colourful fish. Only a 10-minute drive from Freyers Well Bay House is Speightstown, a lively port town that's full of history. Visit the beautiful colonial building that is now the Arlington House Museum to learn more about the area's history through interactive features and knowledgeable tour guides. There are several beaches here, if you want even more sandy stretches to enjoy. You can also watch as local fishermen bring in their catch of the day along the jetty. The capital of Barbados, Bridgetown, is around 40 minutes away by car. Here you'll find even more examples of colonial architecture, as well as a 17th-century garrison and a horseracing track. Other sites of interest include National Heroes Square, the Barbados Museum and Parliament Buildings. Shopaholics will love all the duty-free shops and high-end boutiques on offer throughout the city. You can pick up some beautiful examples of jewellery and china as gifts for friends and family back home.